For the first time this year, I'm realizing that it's possible to reach the point where I've made enough fruit leather and freezer jam, have gorged myself on fresh, and still have an excess of summer fruits. I plan to can whole peaches once the fruits from our late tree are entirely ripe, but the half-ripe-but-brown-rot-affected peaches also need a home, and those seemed like a good candidate for jam. We don't eat much jam, partly because we've eliminated bread from our diet, but more because jam is just so sweet that it seems like a dessert, even when mixed with yogurt. Despite the name, the "low-sugar", cooked jam recipes inside the SureJell box call for 3 cups of sugar for every 4.5 cups of peaches, and I wanted to go much lower than that. So I started reading up on long-boil jams, where the combination of evaporating off water and candying the sugar produces a gel without the sugar-pectin reaction. For my first experiment, I used 1 cup of sugar, a box of low-sugar pectin, 1.5 cups of peaches, and 3 cups of blackberries. The result was a very well-set jam (although far too seedy). I didn't have any canning lids on hand, though, so I just stuffed this first experiment in the freezer. As the jam was cooking, I started looking up instructions for canning jam. The SureJell recipes simply call for sterilizing the jars, pouring the hot jam in, then putting on the lids, with no further processing. While that might have been acceptable even without the pectin, I wasn't sure enough to give it a try. Meanwhile, extension service websites tell me that sugar isn't necessary for preventing spoilage --- that its purpose in jam is merely to maintain the color and to produce the gelatinous consistency. But they also recommend processing any jam for 5 minutes in a hot water bath if you live below 1,000 feet in elevation, and for 10 minutes if you live between 1,000 and 6,000 feet. Despite this data, I was still stumped because the aforementioned extension service websites assumed I'd be adding pectin of some sort, not using the older, boil-down method of jamming. 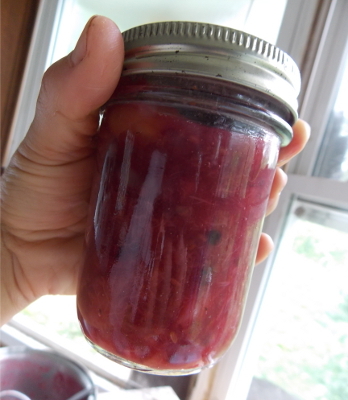 To be entirely safe, I figured I could use the processing guidelines for canning plain fruit, but I couldn't find any data on how many minutes to process peaches and blackberries in cup-size jars. I did, however, read that prolonged boiling weakens pectin, so I opted to stick to the extension service's 10-minute guidelines after all. The result is six little jars of light-maroon jam, which seems to have set up pretty well as it cooled. I guess I won't know for sure if my experiment was a success until I wait a few weeks and open up a jar to see what's going on inside. I'm very new to recipe-less jam-making, so I'd love to hear about your experiences. Any other favorite ways to process small amounts of excess fruit, or (looking ahead), lots and lots of peaches? Our chicken waterer provides clean water, a treat for backyard birds and their owners. 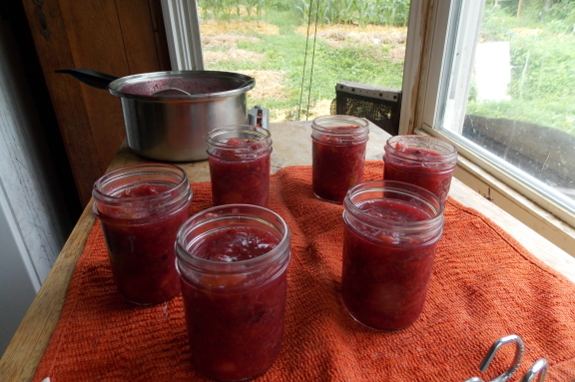 In the past I made a fair bit of jam, but am waiting for more fruit at our new house (soon!--29 peaches this year, pears should bear next year, and lots of raspberries growing, never enough strawberries). I would use diced apples to provide pectin for my raspberry jams. It would set up very well. 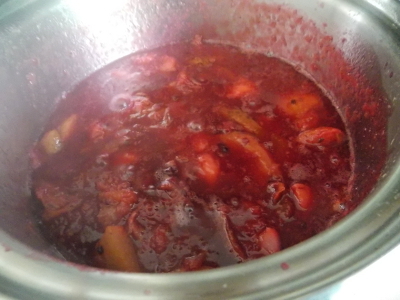 Jams that are cooked for a long time have a much different taste than ones cooked for a shorter period. Much more jammy, but less fresh tasting. I'm not certain what is different, but my mom's raspberrry jam is much fresher and brighter tasting. My kids (we always get some at Christmas) will eat hers straight from a spoon. Even if you won't eat all your jam, it makes wonderful gifts. Most store bought jams are all sugar and corn syrup, with just a little bit of fruit flavoring. Your friends will love the difference. Maybe peach butter would be an option? There's a recipe at http://nourishedkitchen.com/peach-butter-recipe/ I intended to try, but didn't have the peaches to experiment. It actually had spices and no sugar. I follow the cannedquilter at Hickery Hollar Farm and she has a recipe for apple blackberry butter that might be of interest since the amount of suger can vary. That recipe is found at http://hickeryhollerfarm.blogspot.com/2012/10/apple-blackberry-butter.html. I know she reads your blog so maybe she'll chime in with some suggestions from her extensive experience canning. By the way, the jam does looks yummy. Good luck. I like Pomona's Universal Pectin. Because it uses calcium for the gelling reaction, it can be used with little or no sugar (e.g. for 4 quart bags of frozen strawberries, I use less than 1-1/2 cups sugar - makes six pints). You can adjust how much pectin/calcium you use for a soft or firmer set. The fruit flavor really comes through. If you're stuck for ways to use your jam and you have an ice cream maker, a 15 oz jar plus two cups of half and half (or one cup milk and one cup cream) makes some extremely delicious ice cream. :). Strawberry is my favorite, but there's really omsuch thing as bad fruit ice cream..
Anna I use half the amount of sugar suggested and use no pectin rather a teaspoon of lemon and cook it down until think. Having been making this jam for 30 years and it has never spoiled and tastes very good. I've made lower sugar jam without pectin, too. It definitely tastes different, more cooked, but I like the spreadability of it versus the super gelatinous conventional version. A book that I like for giving guidelines versus strict instructions is the Farmer's Wife Canning and Preserving Cookbook. It's based more on pound amounts and things like the jelly test, which suited my needs very well. I had a lot of strawberries, not a lot of sugar and nowhere near enough pectin. I make a lot of jam of all different types. This is the method I use most often for low sugar jams. http://rurification.blogspot.com/2013/01/plum-jam-making-jam-by-proportion.html It's reliable, works for all types of fruit and you can use just about any type of low-sugar pectin that you can get at the store. 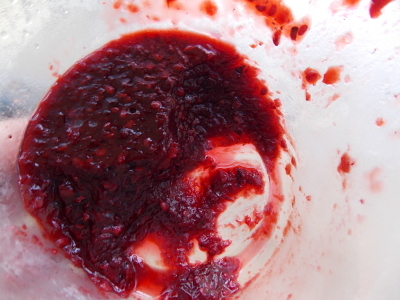 The resulting jam is not too sweet and you can use even less sugar if you like. Basically all that the pectin does is help you reach 221 F (I think that is is - basically a few degrees above boiling) sooner. Once the jam reaches this point it will set/preserve. Once you make the jam you just need to boil it for 5/10 minutes for 1/2 pint size (depending on altitude). Then it is preserved and you can keep it sitting on the self. 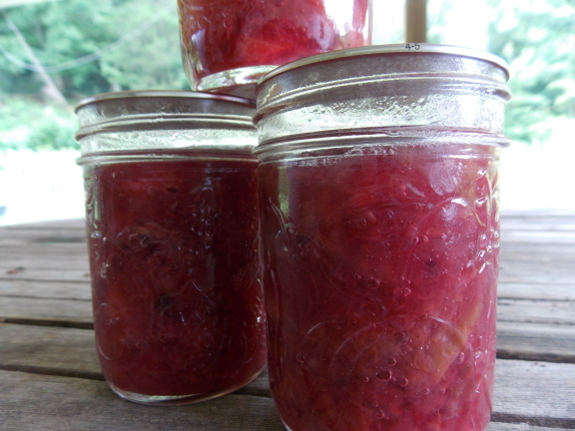 Once you get into canning it is another great way to preserve fruit for later eating. We love eating peaches in the middle of winter :). We also have been preserving using honey instead of sugar. This works well but does take some work to get right. But the peaches/other soft fruit are always done with a "light syrup" made from honey. Also, on using small amounts of excess fruit: there's "The Complete Book of Small-Batch Preserving" by Ellie Topp and Margaret Howard. It has a lot of recipes; we haven't tried them all, but some of them are pretty good. Another vote for Pomona's pectin! I also never make jam with sugar, only honey-- honestly I don't even thing you need that much to get the reaction with the pectin because honey is so sweet. It also depends on the fruit... blackberries have a lot of pectin so you might not even need to add any extra pectin!